Gyoza time...this time, with shio-koji. It's pretty much my standard kurobuta pork gyoza with a few small tweaks. To mix with the pork, I normally blanch cabbage, but this time, I steam-roasted Napa cabbage in my microwavable donabe steam-roaste, TOCHINSAI. I simply cut a small head of Napa cabbage in half, arranged them on a grate, and put in microwave (with cover on) for 4 minutes (700-watt). Yes, TOCHINSAI is a great donabe for prepping vegetables. Instead of blanching in hot water over stove, you can pre-cook vegetable ingredients by steam-roasting in TOCHINSAI in microwave. It's not only easier, but more importantly vegetables tend to retain more nutrients by steam-roasting. The flavor comes out fuller, too. My steam-roasted Napa cabbage came out almost buttery in aroma, and I just wanted to eat it! Napa cabbage was cooled down and minced. Then, mixed with other vegetables, sun-dried shiitake, pork, and just a small amount (about 1 tsp) of shio-koji as a secret seasoning! 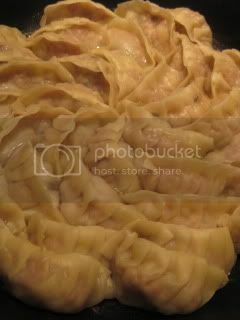 The meat was wrapped in gyoza skin, and steam-fried in a pan until done. Wooow, I've been making gyoza for years, but this version was a total upgrade and just fantastic! The donabe-steam roasted Napa cabbage, and small addition of shio-koji totally brought out the rich flavor of the meat, and again, the gyoza tasted almost buttery. 1. 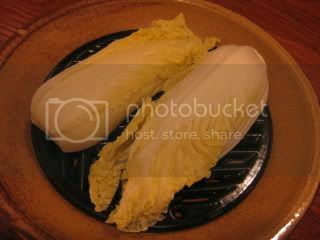 Spread Napa cabbage (if it's a small head, just cut in half lengthwise) on a grate of TOCHINSAI. Cover and cook in 700-watt microwave for 4 minutes. Let it cool down and mince. 2. 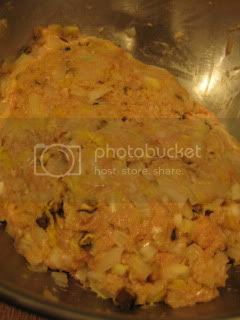 In a large bowl, combine the ground pork, minced onion, minced Napa cabbage, garlic, ginger juice, sake, sesame oil, salt, ground pepper, and potato starch. Mix the ingredients by hand until the mixture is smooth and shiny. Cover tightly with a plastic wrap and let it rest in the refrigerator for 30 minutes. 3. 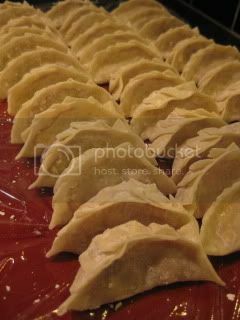 (To make the dumplings) With a small spoon, take a small amount (about 1 tbsps) of the filling and wrap with a gyoza skin. 4. Heat 1.5 tablespoons of sesame oil in a large skillet over medium-high heat. 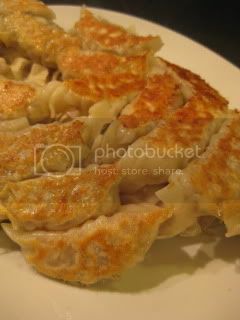 Place the gyoza dumplings in the skillet in one layer. Pour 3 tablespoons of water and cover. 5. Cook for 5 minutes or until the dumplings are just cooked through and the bottom is golden brown. Transfer to a plate.